Control, 2013, 26 X 48” Birth control pills, coat hangers, Christian crosses and encaustic on board. In the United States, reproductive rights and a woman's Constitutional right to self determination have become an arena for conflict between liberal and conservative values, raising questions about family, personal freedom, state intervention, religion in politics, sexual morality and social welfare. Control presents the bookends of reproductive control: birth control pills to preempt impregnation and abortion to cease an existing implantation of an egg in the uterus. 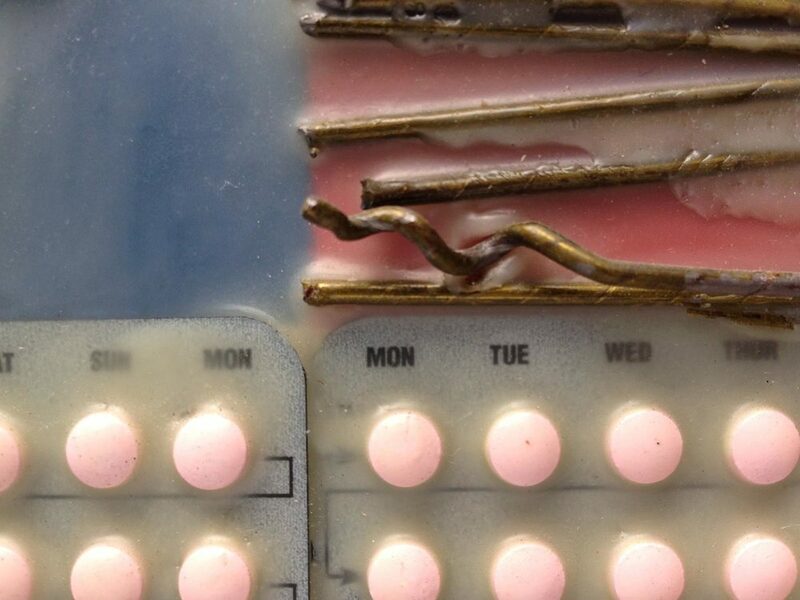 The juxtaposition of birth control pills with abortion coat hangers represents the safe verses unsafe, legal versus illegal issues surrounding reproductive rights. The single most common reason why women have an abortion is not being able to afford the cost of raising a child. Poor and working-class women account for the vast majority of abortions and minority women are more than twice as likely as white women to seek abortions. Similarly, when abortion is illegal or not funded, economically depressed, black and other minority women suffer disproportionately. 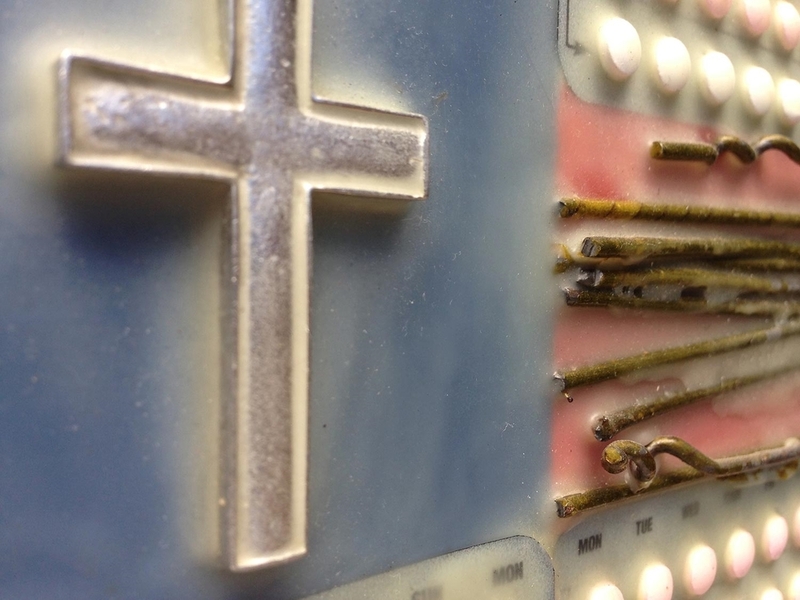 This flag suggest issues of Church versus State along with patriarchal control and questions loss of democratic values at the hand of theology by replacing secular stars with fifty pewter Christian crosses that float in a heavenly star-field. Self-determination, rights of bodily integrity and autonomy, have enabled millions of women to participate fully and equally in society. 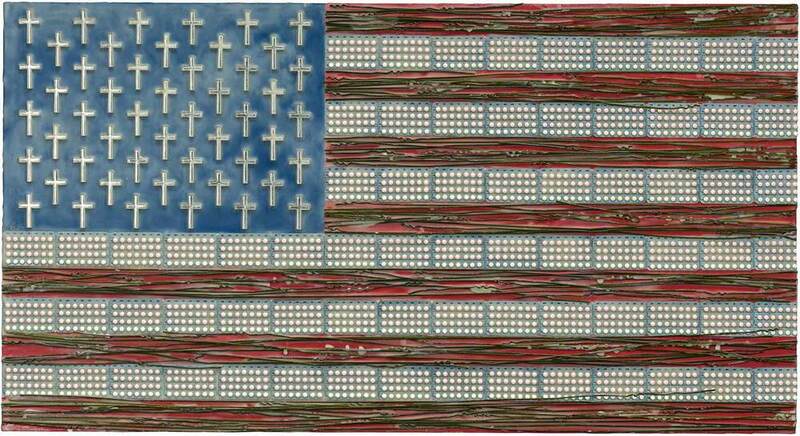 Encaustic wax is applied sparingly to the flag surface to convey the rawness of the discussion surrounding this flag.